What makes the steaks at the steak house so darn good? Well, there are a few things starting with the beef. 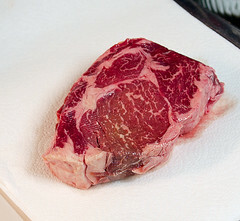 Most steak houses buy Prime beef which has a lot of marbling, or fat dispersed within the muscles tissue. Prime beef is not easy to come by for the regular consumer, but you can find Choice beef in many markets which is a delicious alternative. Second, steak houses age their steaks which improves the flavor and texture. There are two methods, wet aging and dry aging. My preference is dry aged steak. The dry aging removes excess moisture and allows the enzymes in the steak to break down the muscle tissue resulting in very tender meat. I thought that technique was impossible to replicate in a home kitchen since steak houses have climate controlled storage rooms where steaks age for anywhere from two weeks to a month. It seemed beyond my reach. I am happy to report I was wrong. 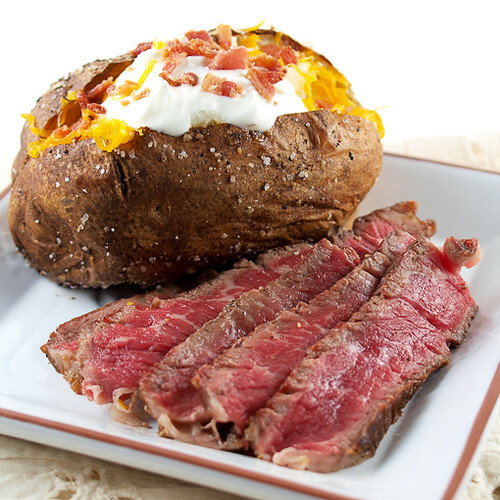 For this fourth, and final, post for the Texas Beef Council* I want to share with you a new way to make your steak. 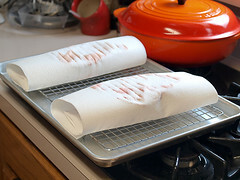 A few months ago I was watching an episode of Good Eats and Alton Brown was demonstrating how one can dry age a steak with nothing more than paper towels, a cooling rack, and a baking sheet. I was skeptical, to say the least, since his method was so simple, but I was also intrigued. 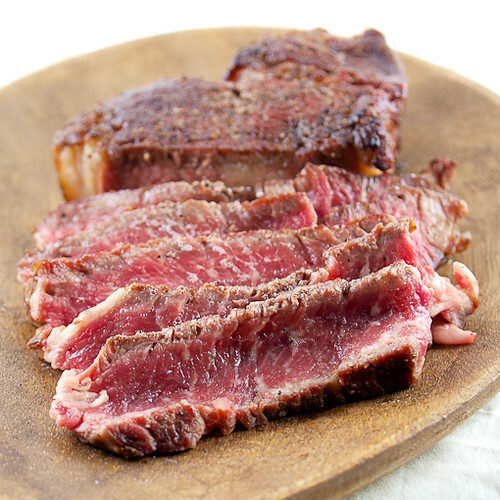 Could I dry age steaks at home? I decided to give his method a try and I was very happy with the results. Of course I have made a few adjustments to the process because of my own experience and preferences, and what results is a steak that is surprisingly juicy, tender, and bursting with robust flavor. 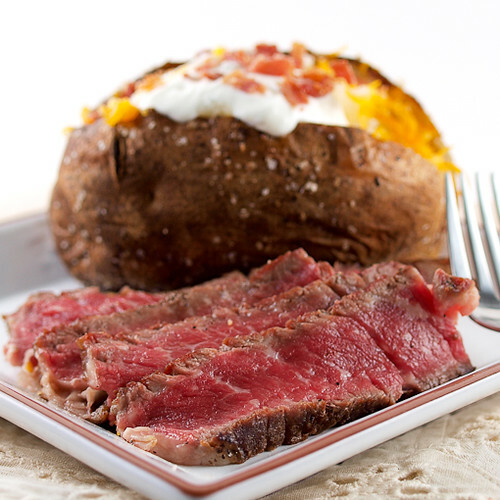 Serve it with a good baked potato** and you may never need to go to the steak house again! Completely dry the steaks on a paper towel. If the steak has been sitting in blood, or other liquid, rinse the steak well before drying. Place the cooling rack on the baking sheet. 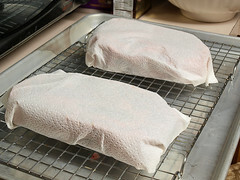 Place the dry steaks on a double thickness of paper towel. 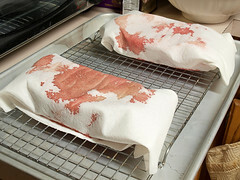 Wrap the steak completely and refrigerate for 48 hours, or until the paper towel is starting to dry out. Remove the steaks from the refrigerator and removed the paper towels. 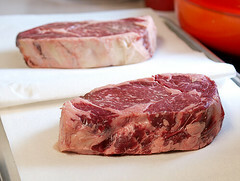 The steaks should be darker in color and the surface slightly dry. Wrap the steaks in a single sheet of paper towel and refrigerate for an additional 24 to 48 hours, not exceeding 4 total days of drying time. When ready to grill remove the steaks from the refrigerator and unwrap. Allow to warm to room temperature, about one hour for a 1-inch thick steak. Brush the outside of the steak with the vegetable oil. 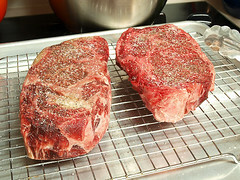 In a small bowl combine the salt, pepper, sugar, and paprika and season the steaks evenly on both sides. 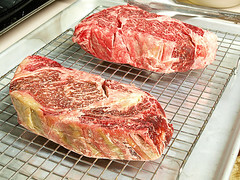 Once the steak is cooked allow to rest, tented under aluminum foil, for ten minutes before slicing and serving. *Evil Shenanigans Product Review Policy and Disclosure– The Texas Beef Council is providing me with a monetary stipend for providing this recipe. Any opinion expressed is my own and is not influenced in any way by the manufacturer/PR firm. I only review products that I have personally tested and endorse. 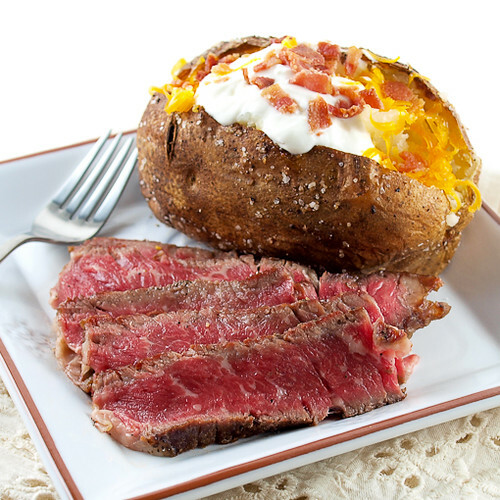 **To make a perfect baked potato just wash and dry the potato, coat in olive oil and kosher salt, then bake at 400 F for about 1 hour, or until the flesh is tender and the skin is crisp. Cool for 5 minutes before serving.